To share a special moment with friends, family or with colleagues, we put our cellar at your disposal for groups (minimum 8 persons) with a choice between different wine tasting offers below. The reservation can be made by email of by letter minimum 8 days before and according to the cellar’s availabilities. The welcoming of groups can be made in the morning between 9:00 and 11:00 or on the afternoon between 13:30 and 17:00, knowing that the guided tour of the wine cellar and the winetasting take at least 45minutes. For smaller groups, we have a winetasting menu available on the spot for which you don’t have to reserve. 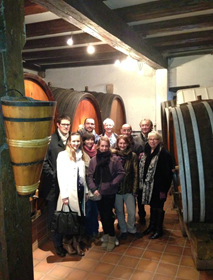 We also do the winetasting and guided tour of the cellar in German and English. In summer and when it’s nice outside, we put tables in your typical Alsatian front yard for an open-air winetasting. In winter or when there is a bad weather, we put our cellar at your disposal.